Grab a bite at Ebony, a restaurant which features a bar and a pool view. You can also stay in and take advantage of the 24-hour room service. Breakfast is available for a fee. When you stay at Airy Singkawang Tengah Salam Diman 129 in Pontianak, you'll be steps from Equator Monument. 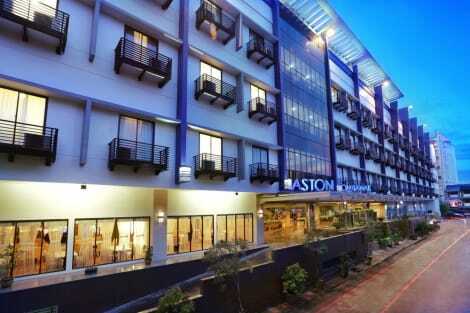 This hotel is 6.1 mi (9.9 km) from Gajah Mada Shopping Complex and 7 mi (11.2 km) from Alun Alun Kapuas. Featured amenities include a business center, complimentary newspapers in the lobby, and a 24-hour front desk. Planning an event in Pontianak? This hotel has 8590 square feet (798 square meters) of space consisting of conference space and meeting rooms. Free self parking is available onsite. Make yourself at home in one of the 133 air-conditioned rooms featuring minibars and flat-screen televisions. Complimentary wireless Internet access keeps you connected, and cable programming is available for your entertainment. Bathrooms have showers and slippers. Conveniences include safes, and rollaway/extra beds (surcharge) can be requested. Welcome to Kota Baru, bringing modern design and international facilities to fast-growing region of West Kalimantan. Featuring a contemporary style, this midscale hotel provides 137 comfortable rooms, all equipped with modern amenities such as flat-screen TVs and free Wi-Fi. And all guests can be assured of legendary service standards, for which our hotels are famous across the world. Located just 25 minutes from Pontianak's Supadio International Airport and close to government offices, banks, tourist attractions, shopping malls and the Pontianak Convention Centre, this is the ideal choice for both business and travelers. Enjoy your stay! Strategically located in the heart of Pontianak, Orchardz Hotel Pontianak is a luxury hotel that boasts a prime location within business, cultural and entertainment areas. The hotel provides comfortable accommodation and convenient facilities are an ideal place for business or leisure guests. Make yourself at home in one of the 156 air-conditioned rooms featuring minibars and LCD televisions. Complimentary wireless Internet access keeps you connected, and cable programming is available for your entertainment. Bathrooms feature showers, complimentary toiletries, and slippers. Conveniences include safes and desks, and housekeeping is provided daily. lastminute.com has a fantastic range of hotels in Pontianak, with everything from cheap hotels to luxurious five star accommodation available. We like to live up to our last minute name so remember you can book any one of our excellent Pontianak hotels up until midnight and stay the same night.